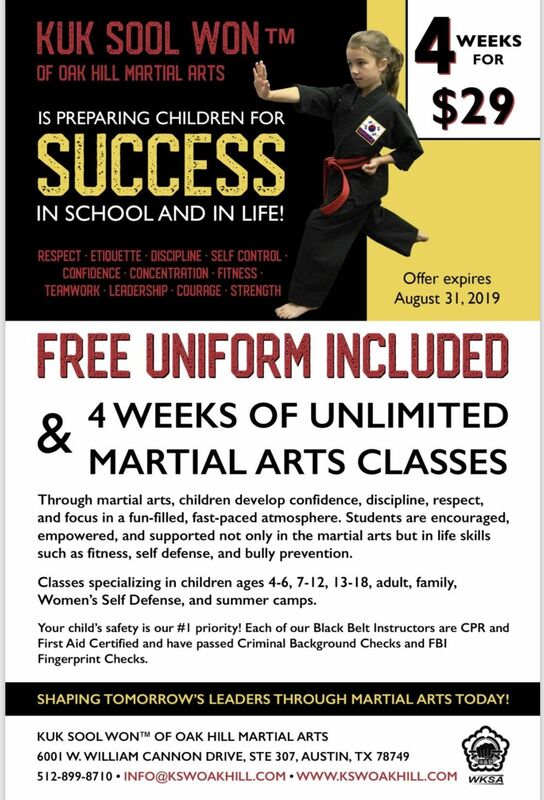 4 weeks of UNLIMITED martial arts classes plus a FREE uniform for ages 4-6, 7-12, 13-adult. Through martial arts, children develop confidence, discipline, respect, and focus in a fun-filled, fast-paced atmosphere. Students are encouraged, empowered, and supported not only in the martial arts but in life skills such as fitness, self defense, and bully prevention. Classes offered 6 days a week, you choose what class times work best for you! Your child's safety is our #1 priority! Each of our Black Belt Instructors are CPR/First Aid Certified and have passed Criminal Background Checks and FBI Fingerprint Checks. We are located in the SW Austin/Oak HIll area. 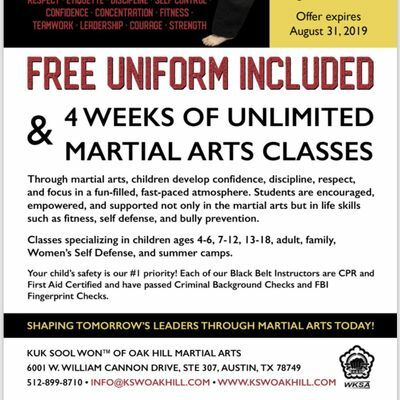 For more information and class schedules, visit our website at www.kswoakhill.com; email aW5mbyB8IGtzd29ha2hpbGwgISBjb20=; phone 512-899-8710; text 512-842-4334.